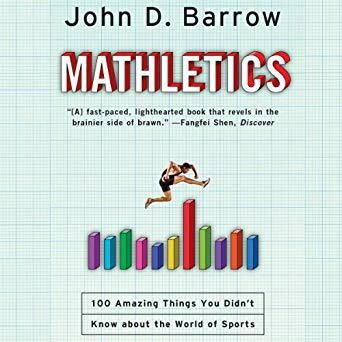 John D. Barrow, Bill Hensel (Narrator), "Mathletics: A Scientist Explains 100 Amazing Things About the World of Sports""
An entertaining, eye-opening guide to what math and physics can reveal about sports. How can sprinter Usain Bolt break his world record without expending any additional effort? Which demands a faster reaction time, tennis or baseball? What dates of birth give rise to the best professional athletes? Is it better to have the inside or outside lane during a race? And how can you improve your balance just by changing your posture? Drawing on vivid, real-life examples, John D. Barrow shows how math and physics can give us surprising, often counterintuitive insights into the world of sports. For example, we learn that left-handed boxers have a statistical advantage over their right-handed opponents and that gymnasts performing the "giant swing" maneuver on the high bar experience stronger g-forces than roller-coaster designers are allowed to create. Thanks to lucid explanations and a healthy dose of humor, Mathletics is the perfect book for sports enthusiasts and math lovers alike.